Brooklyn, NY Two Trees Management will break ground on 260 Kent Ave., the second new building to be erected at the Domino Sugar redevelopment site. Designed by COOKFOX Architects, 260 Kent is a 462,000 s/f, 42-story mixed-use tower and is located within the footprint of the former sugar manufacturing facility. Creating a visual corridor that leads to the East River waterfront, the building will be at the corner of Grand St. and Kent Ave., at the northern end of the five-building development. The Domino site includes the adaptive reuse of the landmarked Domino Sugar refinery and four new buildings on the North Williamsburg waterfront, each designed by various architects under a 2013 master plan created by SHoP Architects. In total, there will be 330 rental apartments at 260 Kent—more than 20% of which will be affordable to low-income residents. The building’s 22-story commercial structure will include 150,000 s/f of office space with 6,000 s/f floorplates. 13,000 s/f of retail will be located in the building podium. The combination of programs and tower formation offers a unique opportunity to prioritize energy efficiency where by the excess heat produced from the commercial space that is traditionally expelled from the top of the building will be captured and reused for residential use (i.e. heat and hot water), significantly reducing energy consumption. 260 Kent’s distinctively modern façade design, inspired by the molecular pattern and forms of sugar crystals, connects the new building with the history of the site. With crisp modernist repetition, its angled white precast concrete creates a deep, faceted façade designed to create a play of light and shadow that animates the rigorous forms. The façade is designed to self-shade, each elevation formed to respond to its specific solar orientation, optimizing shading throughout the year. 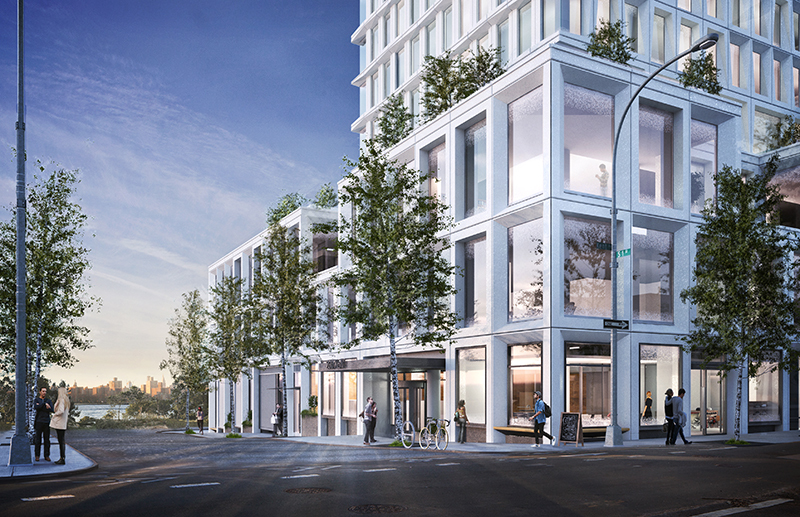 A true mixed-use property, the interlocking workplace and residential towers at 260 Kent are raised at the base by a three-story podium and is topped with a roof garden and shared outdoor recreation space for residential and workplace tenants. The communal green space will serve to connect residents and office workers with their neighbors and offer opportunities to interact, with a view over Domino Park, the new waterfront park below that stretches the length of the Domino site. The the six-acre Domino Park, designed by James Corner Field Operations, will be complete next summer. The first building to open at the site will be 325 Kent Avenue by SHoP Architects. Expected to welcome residents in the second half of 2017, 325 Kent contains 522 rental units, 105 of which are set aside for low-income residents. In total, Two Trees Management is building 2,800 rental apartments across four residential buildings, 700 of which will be affordable to low-income residents.